Consult the detail drawings (Option1: Rainscreen Retrofit, Option 2: Retrofit Brick Ties and Rainscreen) and videos. Always consult with building codes officials before beginning any construction project. Treat the stud cavity for mold and allow to completely dry. Preserve any flashings that are present and clean out weep holes. If weeps aren’t present drill them through mortar joints at the lowest point in the wall to drain water from the rainscreen. Leave brick ties in place, and reinforce with expanding spray foam. If brick ties are missing, install MTI Retrofit Brick Ties. Create a rainscreen drainage and ventilation gap on the interior with the Sure Cavity™ rainscreen drainage plane. Install with fabric facing the installer, back-wrapped at the bottom to create a bugscreen, and shingle-lap fabric in subsequent courses. 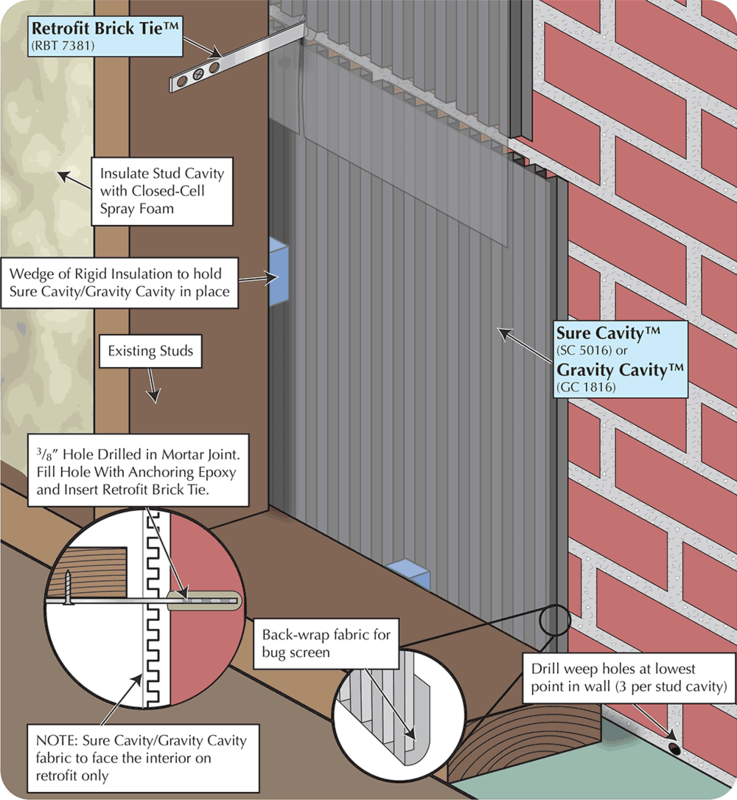 The Sure Cavity can be attached to the studs or wedged in place against the brick wall. Apply 2 inches of 2-pound density closed-cell spray foam insulation between the studs and over the Sure Cavity. Apply a preventative fungicide to the spray foam and stud cavity. In a future flood these drainable, dryable, water-tolerant materials can remain in-place – just wash down and replace the flooded interior drywall. For next steps on rebuilding a flood-resilient interior finish view the wet-floodproofing recommendations below. Where Can I Purchase Sure Cavity Rainscreen? Houston homeowners can order products directly from MTI. Call 800-879-3348 or contact us online. Are There Other Considerations For Flood Recovery? Where Can I Find Other Resources For Flood Recovery And Mold Removal? This guide is NOT comprehensive. Take a chance to learn from people who have been through floods before. Following Hurricane Katrina and other flooding events the Lousiana State University Extension and LaHouse Homeowner Resource Center have partnered with Building Science Corporation to develop and disseminate resources for homeowners. Browse the LaHouse Homeowner resources. Will This Prevent My Home From Flooding In The Future? No. This approach minimizes the materials that have to be removed in a future flood. 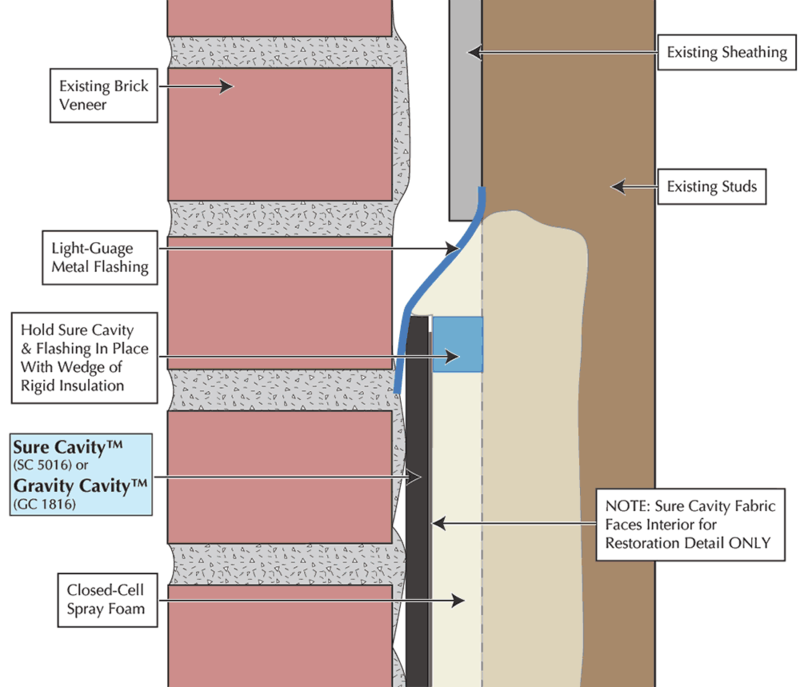 The Sure Cavity Rainscreen and closed cell insulation will not need to be removed. The rainscreen approach is a building science best practice to prevent entrapped moisture problems under normal conditions. Many brick veneers were constructed without the proper air gap behind the brick for drainage and ventilation. Without a rainscreen air gap normal weather conditions lead to a buildup of moisture in the wall system and structural deterioration as well as mold issues. How Should I Transition Between Existing Sheathing & The Retrofit? Flooded exterior sheathing & insulation should be removed to above the flood line. Use light-guage sheet metal to create a flashing from the between the upper sheathing and studs to the brick wall. Install the Sure Cavity to overlap the flashing. How Can I Reduce The Impact Of Future Flooding? 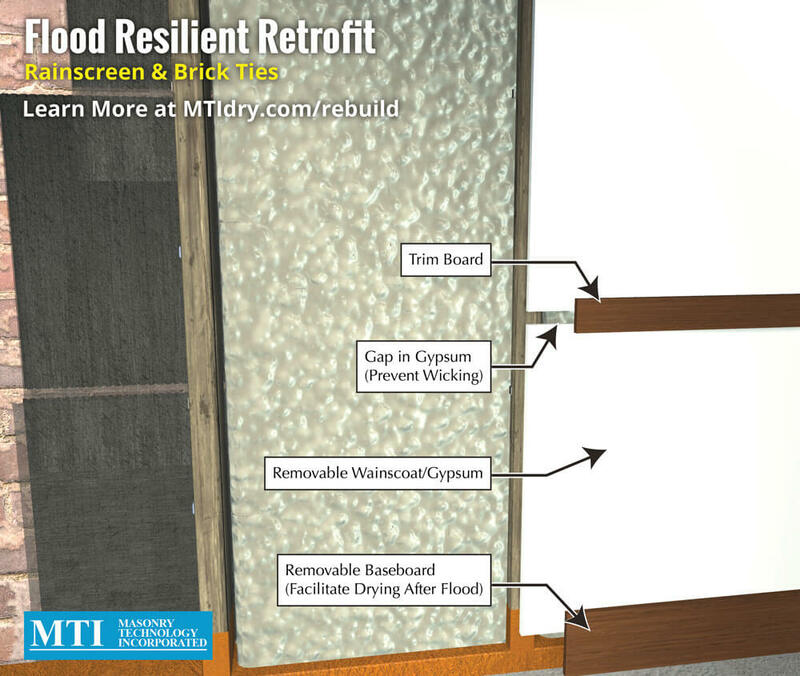 Using the rainscreen retrofit technique along with "wet floodproofing" approach for your interior renovation will result in a wall system that is drainable and dryable. Using flood hardy materials reduces the time and resources required to rebuild after a flood. Do I Need To Plug Weep Holes During a Flood? No. Unless your home is a submarine the exterior materials along with doors and windows are not watertight and will succumb to the flood waters. Standing water in contact with brick walls (or other veneers) will inevitably enter the structure and plugging weep holes will not improve the situation. What Types of Insulation Can I Use? Consider using insulation that is water tolerant, such as closed-cell insulation in spray foam or rigid foam panels. Closed-cell insulation will not absorb water and may not require removal in a future flooding event. Closed cell spray foam also adds racking resistance to the wall. Can I Skip the Rainscreen and Just Spray Foam? Not in residential construction. Let's look at two categories of brick walls: brick veneers and load-bearing brick walls. Load-bearing walls have multiple wythes (thicknesses) of brick and are common in historic institutional buildings. Brick veneers have a single thickness of brick and are common on residential buildings. Applying spray foam to the interior of load-bearing brick walls is common because the multiple wythes of brick can store and redistribute the moisture. In a residential brick veneer, the single thickness of brick is not able to store and redistribute the moisture - it needs a drainage gap on the backside. Spray foam applied directly to the brick veneer leads to premature wear and damage to the brick and mortar. What If I Don't Have Base Flashing? Many homes lack base flashing, but they can still use the rainscreen approach. In this case, the best approach is to use a fluid-applied flashing on the bottom plate, slab, and brick ledge. Do I Need to Be Concerned About Termites? Regardless of your repair approach, any home with wood-based construction needs to be on alert for possible termite intrusion. Though weep holes seem like an obvious area of concern, termites can squeeze through very small cracks, such as those in mortar joints or brick vents. Maintain as much distance between the soil and weep holes as possible and use chemical pest control as necessary. Constant vigilance against termites is required.